Tackling greenhouse gas (GHG) emissions from buildings is a key challenge for California as it pursues carbon neutrality by 2045. Roughly a quarter of the state’s GHG emissions come from buildings, the largest share of which (about half) come from burning natural gas. Building electrification – substituting electric technologies, like heat pumps, for gas-burning ones like furnaces – is a relatively low-cost, low-risk way to reduce California’s building-related GHG emissions. The urgency of achieving reductions and the long runway for policy implementation require policymakers to begin addressing key questions now. These include whether building electrification can ultimately prove cost-effective for households, and whether it can reduce GHG emissions in the near term given the role fossil fuels still play in the state’s electricity mix. E3’s new study, “Residential Building Electrification in California,” provides important insight into these questions. It examines costs, savings, and emissions for electric and gas appliances in six different home types in geographical areas covering over half the state’s population. 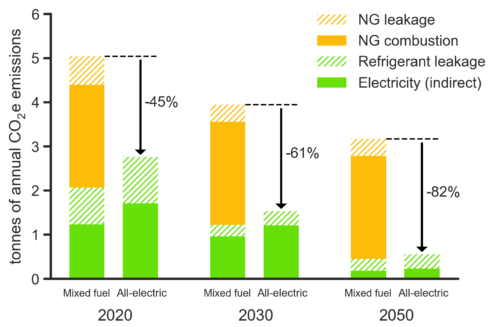 Unlike prior studies, it closely evaluates the consumer cost perspective on building electrification and quantifies GHG emissions savings by home type. E3 found that building electrification would deliver lifecycle cost savings for most home types in the study area. For homes with air conditioning – about 80 percent of the total – the economics are particularly strong. All new construction homes and the majority (84 percent) of existing single-family homes with A/C would save by going all-electric. This is because heat pumps, the dominant technology for electric heating and cooling, are significantly more efficient than their natural gas counterparts, leading to bill savings that typically outweigh any higher upfront costs. For homes without air conditioning the story is more mixed, as these homes wouldn’t realize the capital cost savings of replacing two appliances (a gas furnace and an air conditioner) with one (a heat pump). E3 also found that electrification would significantly reduce greenhouse gas emissions from homes – starting today. For example, a Sacramento home built in the 1990s would immediately cut its GHG emissions nearly in half by switching to all-electric appliances (see graphic). By 2050, with a significantly cleaner electric grid, the GHG savings would grow to over 80 percent – more, if California achieves carbon neutrality. Future GHG emissions from a Sacramento home built in the 1990s under two scenarios: one where the home keeps its gas-burning appliances (the “mixed fuel” cases) and one where the home switches to all-electric appliances. Market barriers must be addressed for the state’s building electrification efforts to succeed. 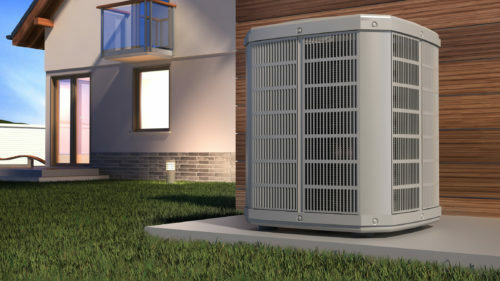 Most homeowners haven’t heard of electric heat pumps, for example, and most contractors don’t know how to install them. Several opportunities exist for electric utilities, regulators, and state agencies to overcome these barriers. Building all-electric new homes and replacing existing homes’ conventional A/C units with heat pumps will save consumers money while reducing emissions. Aligning utility rates with grid costs and sending a carbon price signal will encourage beneficial, efficient electricity use. Developing energy savings targets for whole-building energy consumption (rather than fuel-specific consumption) will enable efficient but load-building technologies, like heat pumps, to qualify for much-needed incentive funding. And given the lack of awareness about electric technologies, educating homeowners and contractors is key. E3 experts Charles Li, Zack Subin, Michael Sontag, Gabe Mantegna, and Amber Mahone conducted the study, which was commissioned by three of California’s largest electric utilities: Southern California Edison (SCE), Sacramento Municipal Utility District (SMUD), and the Los Angeles Department of Water and Power (LADWP). Frontier Energy, Point Energy Innovations, and AECOM contributed to the study.